For many children with learning challenges like dyslexia, who are one- to three grade levels behind in reading, the idea of sharing a book aloud is fraught with anxiety. Finding the courage to overcome the fear of reading can be a battle. “I don’t like reading because I’m not good at it,” says fifth grader Kaleah. But not on Shadow Day. At Sitton School in North Portland, the kids in Mandee Bish’s classroom have picked out their favorite books to share with a new friend—a black and white poodle named Molly, who is there to listen to their reading. 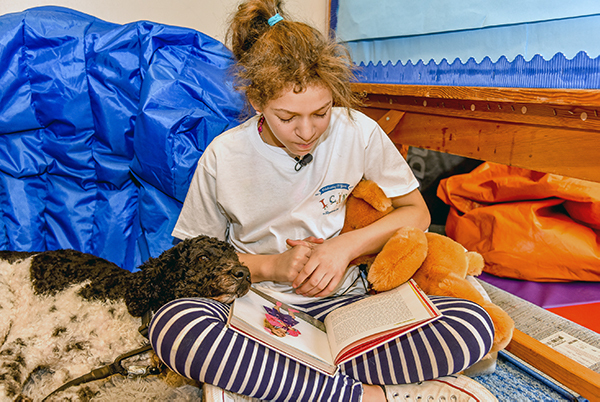 Educators say that dogs make great reading partners because they can gently nudge students to keep going, or strategically place a paw to offer support and enhance focus. Dogs also have a calming effect that can reduce anxiety, and their quiet presence boosts confidence, courage … and reading comprehension. Indeed, Molly quietly lays on her blanket and sets her chin on the kids’ legs, closing her eyes to the soft sound of the students’ reading. No matter that their words are sometimes halting. No matter that they miss some words or mix up letters. Molly patiently listens, and the kids finish their books and forget for a moment their struggles with reading. Shadow Day is an annual event to honor Shadow, a dog born on Valentine’s Day, who is the inspiration behind the nonprofit Shadow Project. The Shadow Project arranged for Molly’s visit in collaboration with Columbia River Pet Partners to celebrate its 15th anniversary in Portland Public schools, and the fourth year in the district’s innovative, collaborative Read Together initiative, which is focused on literacy in underserved schools. The Shadow Project began in two classrooms in Duniway School, becoming a 501(3) organization in 2003. Since then, Shadow has fostered success for more than 11,000 Portland children with learning challenges.